Marvel Comics' Avengers: Infinity War Prelude #1 serves as a prologue to Captain America: Civil War and an official lead-in for Avengers: Infinity War, in theaters May 4th. "When a terrorist puts the Avengers at odds, CAPTAIN AMERICA and THE WINTER SOLDIER go rogue to find him - but IRON MAN isn't far behind. Will the Avengers survive the fallout? Then, find out where Captain America, the Falcon and the Black Widow are headed next - because the world needs heroes, whether it wants them or not. And get a sneak peek at Tony Stark's brand-new armor! Get ready for MARVEL'S THE AVENGERS: INFINITY WAR in part 1 of this special prelude!" The comic book tie-in features unseen moments shared between Captain America, Bucky, and T'Challa, the Black Panther, who spent much of Civil War believing Cap's old war buddy was responsible for the terrorist attack that claimed the life of former Wakandan king T'Chaka. Also revealed are the statuses of each member of Team Captain America, who were arrested by Team Iron Man during Civil War's massive battle that took place on the runway of a German airport. Immediately after abandoning his famous shield following a knockdown drag-out fight with Iron Man — in which the iron Avenger ripped off Bucky's cybernetic arm — Cap and an exhausted Bucky run into T'Challa, who has taken mastermind Helmut Zemo into custody. "Sergeant Barnes... I wanted to apologize to you for all that has happened," T'Challa tells the formerly brainwashed assassin. "I believed you to be responsible for my father's murder, but I now know his death was the result of Zemo's machinations. It was you and Captain America who led me to uncover this truth. And for that I wanted to offer you my assistance. The mental programming you were forced to endure, transforming you into a Hydra assassin — I may know of someone in Wakanda who can assist in purging your mind of it." T'Challa departs, telling the pair he must deliver Zemo to "receive the world's justice" for his crimes against the United Nations. Civil War sees Zemo entrusted into the care of CIA Agent Everett Ross, who tells Zemo his plan failed. "Did it?" he asks, knowing he fractured the Avengers. Immediately after the Siberian battle with Iron Man, Cap and Bucky fly over the Raft — the high-security floating prison that held Falcon, Hawkeye, Scarlet Witch, and Ant-Man after their capture at the hands of Team Iron Man. Bucky goes to apologize to lifelong friend Steve, who won't hear it. "Save it, Buck," Cap says. "I've told you time and time again... I'm with you till the end of the line. Now I've got to save some friends who've done the same for me." Cap leaps out of the Quinjet and hits the water, swimming towards the Raft. Cap swiftly takes out an entire room of Raft guards, rendering them unconscious, and reunites with his loyal Avengers. Cap steps out of the darkness. "Told you he wouldn't leave us behind, Clint," Sam says. The Avengers freed from their cells, Clint, a.k.a. Hawkeye, announces his official retirement. "This has been fun, but believe me when I say that I am officially retired now," he says. An understanding Cap tells the family man to "go back home and take care of that brood of yours." 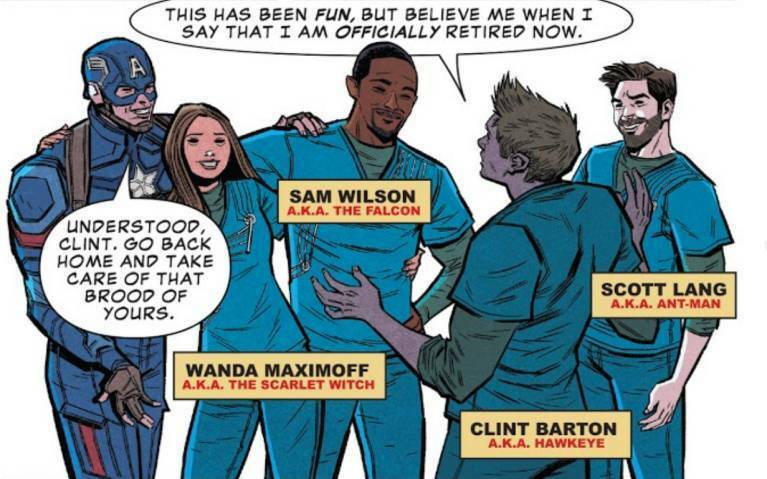 Hawkeye returns home and reunites with his wife and kids, as does Scott Lang, who is seen reading a bedtime story to his young daughter Cassie, nestled into his shoulder. Cap drops Wanda off to visit an "old friend," and she's all smiles as she walks arm-in-arm with a sweater vest-wearing Vision (in his projected human form). In Wakanda, T'Challa aims to assure Cap that Wakanda's scientists will be able to restore Bucky's mind. "In order for Sergeant Barnes to be cleansed of his programming, he will have to return to cry-sleep stasis so the Wakanda design group can do its work," T'Challa says. Bucky agrees to undergo the process. "The scientist leading this initiative is the most gifted in Wakanda," T'Challa tells the American fugitives. "I'd trust her with my life." In Wakanda's sprawling lab, T'Challa's 16-year-old genius inventor sister, Shuri, explains the safeguards process to Cap and Bucky. The process, she says, will involve using Wakanda's most sophisticated bio-scanners to create a one-to-one digital representation of Bucky's brain. The progress will be tested and re-tested in a digital construct to avoid damaging the actual brain tissue. "It's not as simple as erasing mental programming outright. There's no delete button here. And a majority of his programming is linked to trigger words. The last thing we want to do is remove all of who Sergeant Barnes is -- his loves, his hates, his quirks, his whole personality -- when trying to destroy what Hydra made him to be. The hardest part is rooting out the extent of his memories that have the greatest amount of control over his physical actions... the ones that have been manipulated due to their deep emotional trauma... of which there are very, very many." The genius inventor-slash-scientist has been running analgorithm capable of efficiently flushing out the influence of the trigger words while retaining the core context and content of Bucky's original memories. "Essentially, I should be able to reboot him," Shuri says. "But more exciting is that this algorithm should provide even greater advancements in Wakanda's own artificial intelligence applications in the near future," Shuri adds. "It's so much simpler than that silly shortcut Tony Stark took in creating Ultron. Of course, that's 'cause I'm smarter than him." Steve — now sporting a full and rugged beard — is in Syria with Natasha (Black Widow) and Sam (Falcon), tracking down terrorist splinter cells in an effort to keep Chitauri-fueled weapons out of the hands of the world's most dangerous criminals. Natasha's old KGB contacts come in handy as the trio infiltrate and take down terrorists who are seeking adequate firepower to "lay waste to the regime." Because they're operating without the sanction of the United States and the Sokovia Accords, they have to strip the captured Chitauri components and render them unusable before making a quick exit. "Sure you don't want to call Tony in on this, Steve?" Natasha asks. "I'm sure he's got enough on his plate." At Avengers compound, Tony Stark is tinkering in his lab. The Iron Spider costume rests in the background. A cellphone, mailed to him by Steve, sits within reach. Stark is deep in thought. "After everything that's happened... how can I not feel guilty? I got distracted. Didn't focus on the real threat that's coming." He recalls a moment from Avengers: Age of Ultron, where Steve told him — win or lose — the Avengers will do it all together. Tony alludes to the catastrophic nightmare he had in Ultron, where he envisioned all of his Avenger teammates slain before him. "If I made the call, I'm sure Steve would answer. But will that be enough? Can't think of it that way," Tony thinks. "If I'm gonna prepare for the end of all things... I'll have to figure out how I can do it alone." Tony holo-projects his new suit as the comic ends, teasing "the cosmic threat from above!" The second issue of the two-part story releases February 28th. 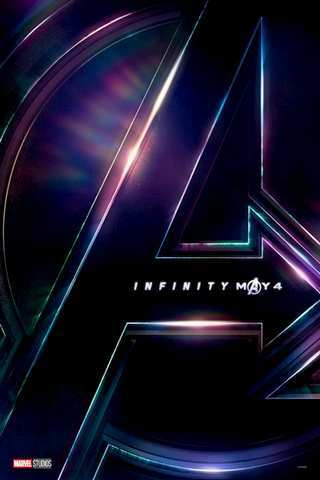 Avengers: Infinity War opens May 4th.